The first trailer for Glass has arrived. The trailer debut has been hyped up a great deal by Universal and Blumhouse all week. They've been teasing some brief footage ahead of their presentation for the highly-anticipated sequel at San Diego Comic-Con. Now, fresh off of its debut in Hall H at the massive pop culture event, the trailer has made its way online, giving us our best look yet at the upcoming conclusion to the trilogy that M. Night Shyamalan started nearly two decades ago. Though not a comic book movie in the traditional sense, Glass follows in the footsteps of Unbreakable, which told the story of real-world superheroes and villains. This movie picks up after the events of last year's massively successful Split which, to the surprise of everyone, wound up being a secret sequel to Unbreakable. Shyamalan pulled one over on all of us big time with that reveal, which paved the way for this third movie in the series to happen so quickly. Not only was Split a massive commercial success, but critics and audiences alike were in love with it. The cast for the movie includes Bruce Willis as David Dunn, Samuel L. Jackson as Elijah Price, aka Mr. Glass, James McAvoy as Kevin Wendell Crumb, Anya Taylor-Joy as Casey Cooke, Spencer Treat Clark as Joseph Dunn, Charlayne Woodard as Mrs. Price, and Sarah Paulson as a psychiatrist who deals with Dunn, Price and Crumb. Glass finds David Dunn, who made a brief appearance at the end of Split, pursuing Crumb's superhuman personality The Beast in a series of encounters, which escalate as they go on. All the while, Elijah Price emerges as an orchestrator who carries with him secrets crucial to both Dunn and Crumb. Prior to the release of M. Night Shyamalan's littler horror hit The Visit in 2015, the man behind The Sixth Sense had been churning out awful movies, such as Lady in the Water, The Happening, After Earth and The Last Airbender, for the better part of a decade. However, The Visit paved the way for him to do Split with Blumhouse, which helped dig him out of a very bad place creatively. 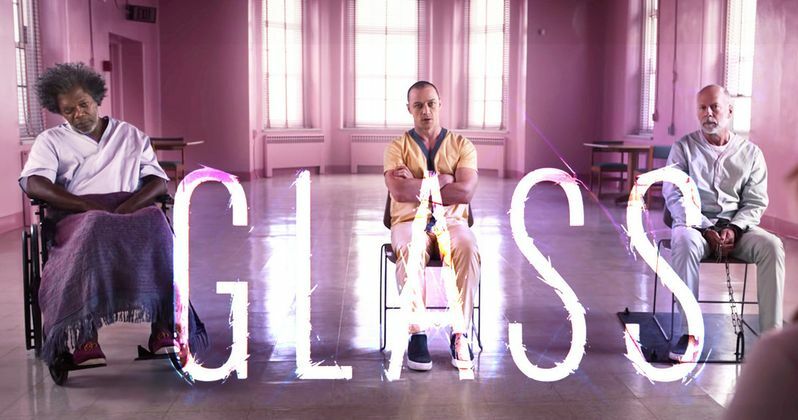 If Glass winds up being even half as good as it looks, Shyamalan could really, truly be back which is, beyond the movie itself, an exciting thing to think about on a more broad scale. Luckily, Blumhouse and Shyamalan made quick work of Glass and didn't make us wait another 17 years between sequels. There are a lot of big comic book movies and franchise sequels coming our way next year, but this is going to be at or very near the top of many people's lists when it comes to what they're most excited to see. Glass is set to arrive in theaters on January 18, 2019. Be sure to check out the first trailer, courtesy of Universal Pictures, for yourself below.